I use love using uv cure resins. I tried CCG (worked but messy and tacky). I now us Loon. They say after using Loon thick or thin to go over it with flow. I have noticed with the the flow it is greasy and still somewhat wet after curing. It also has a resiny smell until completely cured (in sun). I tried to get a better uv light, then a salon uv light for curing nails. The only thing that takes away the "wetness" and fully cures is leaving the flies in the sun for 3 to 4 hours. I would like some resin that is drip, blast with light, and go. I do a lot of tying on the go. What are your experiences with Loon, especially Loon Flow? What are your experiences with other resins? I am looking for a very thin, tack free, odorless resin. Any input is appreciated. 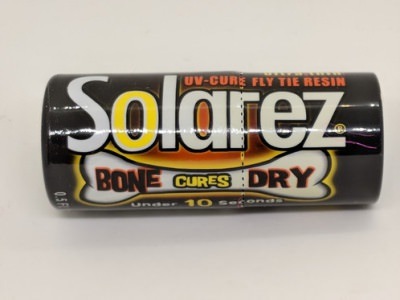 I'd suggest checking out Solarez Bone Dry. Pretty impressive stuff. Another vote for Bone Dry. There was discussion recently about someone who had a severe allergic reaction to Solarez. To quote the Sergeant on Hill Street Blues, "Be careful out there." Im going to give it a try. Thanks! I recently ordered some Deer Creek fine since I appear to be allergic to Solarez. Its not as thin as Bone Dry, but it cures up quickly and tack free. The biggest downside is it has an odor that I find very unpleasant! My wife swears by the Deer Creek Flex for the low tack and, she says, no odor—something I agree with. From a fishing standpoint, I can attest to its high durability. I haven't tried the flex as I really don't find myself using any flex resin much. But the Fine has a very noticeable odor out of the bottle. She’s been playing with shrimp tails and antennae, but it seems to work well as a general purpose resin, too. I haven’t found much use for the flex either, as I like the shiny hard finish of the other formulas better. One thing I have found flex good for is if you want to extend a bucktail body beyond the hook, similar to a surf candy or epoxy sandlance. It makes it the tail in that area rigid so it helps eliminate fouling but it still has a bit of wiggle because it isn’t so hard when cured. She’s been working on a shrimp that swims with lifelike motion when you strip. Also, the flex is a little more forgiving when I get stupid on my back cast and hit a rock. But yes, hard has its benefits. Where would you put the Gulff materials in your order of preference? I've found the Bone Dry to be pretty durable as I've been know to beat a clouser or two against beaches over the last 30 years. I'm just glad we have all these choices in UV resins. We've never had it so good. I'm sure someone will complain their are too many cure options.....just like those damn new overweighted fly lines models, lol.